Tilted Horizons: RevZilla's December Motorcycle Gear Giveaway! 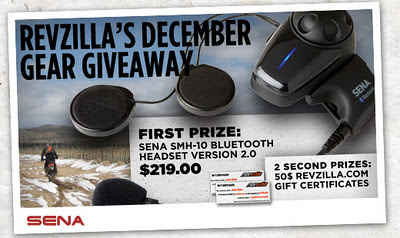 RevZilla's December Motorcycle Gear Giveaway! Curious about Bluetooth for your motorcycle helmet but hesitating to pull the trigger? If so, how'd you like to have a top-quality Bluetooth set-up for free? Than click over to RevZilla's December contest page, spend about 30 seconds creating a Rider Profile, than sit back and wait for the monthly winners to be drawn. The First Prize winner this month will receive a highly-rated Sena SMH-10 Bluetooth Headset V. 2.0 valued at $219. Two Second Prize winners will receive $50 Revzilla gift certificates.